Part 1 of 3 - Journal and tasting notes from visits to several California Central Coast wineries and vineyards. The Central Coast remains one of my favorite California wine regions to visit, so when friends Jane and Warren told me they were planning a trip there in January, I signed on. A couple of other friends who were planning to join us had to drop out qt the last moment, so for most of this trip it was just the three of us. Jane put me in charge of making winery appointments, and I made a handful of them to anchor our schedule, but I tried to leave plenty of time for us to do whatever else we felt like during the five-day trip. Unlike last year, when the early winter season was particularly dry, this year the hillsides were completely green all along our journey. But unlike some years, when it’s not uncommon to see snow on the higher coastal mountains, any earlier snowfall had already melted. We had beautiful clear weather throughout trip, though we were going through a particularly cold spell for much of California, with temperatures dipping into the mid-20s at night along the Central Coast and only occasionally rising into the 50s during the day. We started out on a Friday morning, and since Jane and Warren needed to return home to the Bay Area a day earlier than I did, they drove south separately from me. We met in Templeton, just south of Paso Robles, for lunch at Pier 46 Seafood – a great spot for all sorts of fresh seafood. We enjoyed fish tacos and a large helping of very good fish & chips. After lunch, we headed a short distance west of Highway 101 along Vineyard Drive in Templeton before turning south, and within just a few minutes we arrived at a handsome house overlooking a vineyard – there we met Jeff Strekas, associate winemaker of ONX Wine. Eric Anderson had suggested making a stop at ONX – pronounced “onyx” – after a friend of his told him that he’d had a very good tasting experience there just a week or so before our trip. Jeff led us to the rear patio of the house, where we had a great view of the surrounding Briarwood Vineyard. Located about 9½ miles from the ocean, the site is within the well-known Templeton Gap, where ocean air funnels through a low point in the coastal mountains, creating a cooling affect that tempers the often-hot Paso Robles-area summer days. Jeff told us that the house belongs to the vineyard owners, and there were still lots of holiday decorations inside. ONX 2011 “Field Day,” Paso Robles. 75% Sauvignon Blanc, 25% Viognier. Light straw color, showing slightly floral tropical fruit along with pear and fresh herbs. Medium-bodied with lively acidity and a long, pleasant finish, nice. 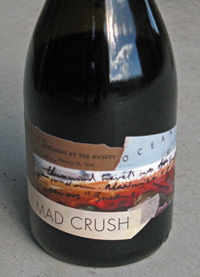 ONX 2010 “Mad Crush,” Paso Robles. 50% Grenache, 19% Tempranillo, 19% Cabernet Sauvignon, 12% Syrah. Medium-light color, intense strawberry and raspberry fruit, with touches of dried herb/tobacco, earth, and vanilla/oak. Medium-weight in the mouth, this finished with milder tannins. ONX 2010 “Moxie,” Paso Robles. 50% Zinfandel, 29% Syrah, 11% Tempranillo, 10% Cabernet Sauvignon. Medium color, bright ripe boysenberry, spice, and undertones of sweet oak. Medium-bodied with a bright, lively mouthfeel and finish along with a slight minerally note on the palate. ONX 2010 “Reckoning,” Paso Robles. 79% Syrah, 12% Tempranillo, 9% Cabernet Sauvignon. Dark color, featuring dark berry fruit, smoked meat, earth, and spice. Richer and more full-bodied, this had chalky tannins on the lingering finish. 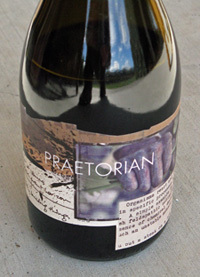 ONX 2010 “Praetorian,” Paso Robles. 42% Tempranillo, 30% Cabernet Sauvignon, 24% Syrah, 14% Grenache. Medium-dark color, this displayed herb and earth aromas, plum and darker fruit notes, minerals, and some vanilla/oak. Big and structured, with a mouth-coating texture and a grippy tannic finish that suggests some time in bottle will be beneficial. ONX is the project of proprietors Steve and Brenda Olson, who purchased 43 acres in 2005 and have added to that in the years since – the overall property is now 121 acres on two adjacent parcels. Briarwood Vineyard itself has 27 acres currently planted, and Jeff told us that another 25-acre planting is in the works. In addition to Jeff, the Olsons brought in a number of other ONX team members, including Brian Brown as winemaker and Ben Epstein as vineyard manager. Both Brian and Jeff worked at Round Pond Estate in Napa Valley – Brian is still the Round Pond winemaker as well (he’s also worked in Australia and at other Napa producers including Vineyard 29), while Jeff is the man on the scene in Templeton. Originally from Connecticut, Jeff earned a degree in chemical engineering, and worked as a biochemical engineer in Philadelphia. But he eventually caught the wine bug and moved to California, entering the enology program at UC Davis. He worked at Merryvale and Franciscan in Napa, then made a detour to McLaren Vale in Australia where he worked at Mollydooker, and then back to Round Pond in Napa. He was busy working on a business plan on the day of our visit – more proof that winemaking is not all fun and games! Jeff talked about the vineyard as we admired the sweeping vista from the patio. The site is just upslope from Paso Robles Creek, and Jeff mentioned that this area is a little cooler than many Westside vineyard sites. The soil is mostly alluvial loam, with some sandy and rocky areas, and Jeff noted that there is better water retention in the soil closer to the creek. Alluvial fans were noticeable across the creek. There is some calcareous subsoil as well as traces of onyx, leading to the winery name. Why “ONX” rather than “onyx”? Look closely and you’ll spot the “Y” cleverly hiding within the “N” of the logo. The site is in a windy spot, and as in other windy areas, this can be difficult on fruit development. Jeff told us that it’s been particularly tough on their Cabernet, which produced only one ton of fruit over 1.3 acres last year. He said that the farming methods are close to organic, and that the vineyard is in the process of obtaining SIP (Sustainability In Practice) certification, a sustainable growing program that is gaining strength throughout the Central Coast. While the vineyard includes a number of Rhône grape varieties – the Westside of Paso Robles being a hotspot for those – the Olsons and their ONX team decided from the start to plant a more diverse variety of grapes on the property. Thirteen varieties are currently planted – Sauvignon Blanc, Grenache Blanc, Viognier, Syrah, Grenache, Mourvèdre, Cabernet Sauvignon, Malbec, Tempranillo, Zinfandel, Primitivo, Petite Sirah, and Alicante Bouschet. Some of these are planted as field blends. The oldest vines on the property are nine years old and the youngest are four (the Malbec and Grenache Blanc), and Jeff said the next varieties to go in will be Petit Verdot and Sangiovese. There are over 20 distinct vineyard blocks, with multiple clones of some varieties, and different rootstocks and trellising systems in various parts of the vineyard depending on the grape variety and soil. Besides using the Briarwood Vineyard fruit for the ONX wines, some is also sold to Tablas Creek (for their “Patelin de Tablas” wines), as well as to Chronic Cellars, Zenaida, and Cass. And in addition to the grapevines, Jeff said that some apple and fruit trees will be going in on the property soon. We all sat down on some comfortable seats on the patio, in a spot where we were nicely-sheltered from the chilly breeze coming through the Templeton Gap, and Jeff opened bottles of most of the latest ONX releases for us to taste. All of the wines are made from 100% estate fruit. We started with the 2011 “Field Day” white blend. An unusual Sauvignon Blanc / Viognier blend intended as a lighter summer wine, the entire Sauvignon Blanc component is the more fragrant Musque clone of that variety. The 2011 vintage was entirely fermented in neutral oak, with no lees-stirring, and bottled in February 2012 to minimize the time spent in barrel. The upcoming 2012 vintage was made mostly in neutral barrels, plus a small amount in new oak and in stainless steel drums. We moved on to four 2010 reds, beginning with “Mad Crush” – this Grenache-based blend is made mostly from younger vines, with different varieties fermented separately and blended. The Zinfandel-based “Moxie” blend featured fruit that was big and ripe but not as jammy as Paso Zins can sometime be. Jeff told us that there are six Syrah clones planted at the vineyard, and that the Syrah-heavy “Reckoning” blend is mostly 470 clone. The last wine we tasted, “Praetorian,” has its varietal components somewhat more evenly distributed but it includes Tempranillo as the primary grape. ONX produced one other 2010 red that we did not taste – called “Crux,” it’s a Tempranillo / Cabernet / Grenache blend. Jeff told us that they use about 25-30% new oak for Rhône varieties, about 50% for Bordeaux varieties. He also said that they’ve been using more puncheons, including using them for some fermentations. The 2010 reds spent up to 14-16 months in barrel. We asked about the wine names, and Jeff said that they describe each wine – “Mad Crush” was for a particular crazy harvest, “Moxie” because that Zin-based blend certainly has it, “Reckoning” for its brooding nature, and “Praetorian” due to its structure. I asked Jeff whether he and Brian have any particular model or benchmark for their wines, since most of them are unusual blends, using grape varieties in combinations that are not often seen. He told us that they didn’t follow any real model for the blends, but he noted that the primary winemaking focus is on the aromatics of each wine. The first release of ONX came from the 2008 and 2009 vintages, so this is a very new winery, with wine sales beginning only a little over a year ago. Production is small, with all of the current release bottlings between 75 to 160 cases. The total 2010 vintage production was around 550 cases, and Jeff said this will increase to about 850 cases for 2011 and more for 2012. The ultimate target level is in the range of 2,500 to 3,000 cases per year. The wines are currently produced at the Zenaida facility just a few miles from the vineyard. Most wine is sold direct, and some goes to southern California restaurants as well. The ONX wines feature some unconventional blends, and they reminded me a bit of similar ones from a few other Paso Robles-area producers. The wines are certainly made in the bigger “Paso Robles style” – all of the reds were listed at 15.5% alcohol – though I sensed more restraint than some other wines I’ve tried from this region, and they didn’t seem hot or unbalanced to me. All of the wines were solid, and I especially liked the “Field Day” white blend, while the “Mad Crush” was my favorite of the reds. Overall, ONX looks like a promising new winery, though it has not yet set itself apart from a crowd of other similar – and more established – producers in the area. I’ll be curious to see how this winery and their wines develop in the coming years. Our next stop of the afternoon was not far away, over the 101 freeway to the rolling hills just east of Templeton, where we headed to Wild Horse Winery. Jane and Warren had tasted several Wild Horse wines in early November at one of the “Vintners’ Holidays” sessions at the Ahwahnee Hotel in Yosemite Valley, and they wanted to visit the winery. I had not been there in a number of years, so this was a good chance to catch up with what they’ve been doing. Fortunately I remembered the series of abrupt speed bumps along their winery drive, and took care to approach them very slowly. Wild Horse 2011 Malvasia Bianca, San Bernabe. Very light color, with intense floral, perfumed Muscat-like aromas along with nectarine and peach. Medium-light bodied with bright acidity and a slightly sweet finish, a nice warm-weather sipper. Wild Horse 2011 Verdelho, Paso Robles. Sourced from the estate vineyard. Light color, showing pear and a bit of citrus, with touches of spice and vanilla/oak. More weight on the palate than the Malvasia, with less apparent acidity and a smooth finish. Wild Horse Unbridled 2009 Pinot Noir, Bien Nacido Vineyard, Santa Maria Valley. Medium-light color, this featured black cherry with a touch of tomato, herbs, earth, and oak. Medium-light bodied with mild tannins and distinct Santa Maria Valley character. Wild Horse Unbridled 2010 Pinot Noir, Arroyo Grande. Sourced from Laetitia Vineyard. Medium ruby color, displaying a darker fruit profile than the Bien Nacido bottling, plus some tea leaf, spice, and more noticeable vanilla/oak on the nose. Medium-rich mouthfeel with more structure and moderate tannins on the finish. Wild Horse 2010 Blaufrankisch, Paso Robles. 98% Blaufrankisch, 2% Merlot. Sourced from the estate vineyard. Medium purple color, with an earthy character along with dark berry fruit, spice, and a peppery note. Medium-bodied with a slight minerally element on the palate and fairly grippy tannins. Wild Horse Unbridled 2009 Malbec, Halcyon Vineyard, Paso Robles. 95% Malbec, 5% Petit Verdot. Dark color, earthy and peppery with blueberry and darker fruit plus touches of herbs and sweet oak in the background. Fairly big and structured, with a tannic finish that could use time to mellow out. Founded in 1981 by famed Central Coast vintner Ken Volk, Wild Horse grew considerably during the 1990s. Ken sold it in 2003 (he now runs his own eponymous label), and it’s currently owned by Constellation Brands. 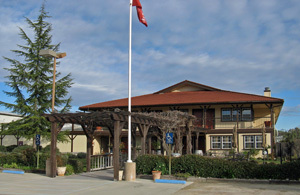 The winery’s four basic “supermarket wines” – Central Coast Chardonnay, Pinot Noir, Merlot, and Cabernet Sauvignon – take up most of the winery’s production, but they also make about 17 other smaller-production bottlings. There are three different levels of wines – the core Wild Horse label, which includes some off-beat varieties in addition to the standards, the Unbridled line with more limited reserve bottlings, and Cheval Sauvage (French for “Wild Horse”) for their top-end wines. Some bottlings are only available at the tasting room and through the wine club. 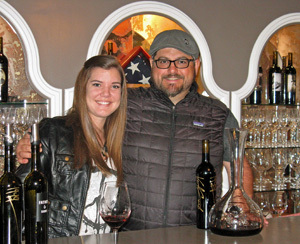 Clay Brock, formerly of Zaca Mesa in Santa Barbara County, is the general manager and director of winemaking, and Chrissy Wittmann is the winemaker. Michael was behind the tasting bar when we arrived, and he poured us a selection of wines from both the Wild Horse and Unbridled lines. I was happy to see that they still produce many of the lesser-known varieties that they did back in the Ken Volk days – I tried a Malvasia Bianca, Verdelho, and Blaufrankisch on this visit. The Malvasia was made in an off-dry style, and the fruit came from San Bernabe Vineyard in Monterey County – a vineyard so large (about 5,000 acres, the largest contiguous vineyard in the country) that it has its own AVA. Blaufrankisch may be the most obscure variety that Wild Horse produces – it’s grown mainly in Austria and Hungary, where it’s called Kekfrankos. Michael told us that the 2009 Malbec was the winery’s first-ever release of that variety. He also said that they will have a new Zinfandel / Syrah / Cabernet blend coming out soon. In addition to the wines noted above, Wild Horse’s current releases also include Viognier, other Unbridled bottlings of Chardonnay, Pinot Noir, Zinfandel, Syrah, Merlot, and Cabernet, and a Cheval Sauvage Pinot from Sierra Madre Vineyard in Santa Maria Valley. Jane and Warren were a little disappointed not to see one of Wild Horse’s noted attractions, Floyd the llama – he was busy helping to herd the neighbor’s sheep. Wild Horse wines have become such a common sight on supermarket shelves that it can be easy to forget that they also produce a host of other more interesting bottlings. While the Unbridled wines we tasted were nice enough, I think it’s the wines made from more unusual varieties that continue to set Wild Horse apart. The Malvasia Bianca was my favorite, though the Blaufrankisch was a distinctive wine as well. Overall, Wild Horse remains a dependable, if not always especially exciting, producer of Central Coast wines. We had time for one more afternoon stop, and the Paso Robles wine touring map showed the tasting room for Clavo Cellars right along the main street of Templeton, so we decided on that. Templeton’s main street – which, interestingly enough, is called Main Street – looks to be in the process of changing, with the Clavo tasting room, Joe’s Other Place Restaurant (great breakfast stop), and 15C wine shop (recently relocated from the other side of Highway 101) opening in recent years. These places join old standbys like McPhee’s Grill, Hoover’s Beef Palace (another fine breakfast option), and the Templeton Feed & Grain facility with its tall grain elevators that still dominate the main drag through town. Clavo 2010 Albariño, “Olé,” Paso Robles. Light straw color, with tropical fruit and a touch of spice. Medium-light bodied with moderate acidity and finish. Clavo 2010 Vermentino, “Voluptuous,” Paso Robles. Light straw color, this had a more herbal character, plus pear and tropical fruit. More weight in the mouth than the Albariño with a bit more noticeable acidity but still a smooth mouthfeel and finish. Clavo 2009 Pinot Noir, Righetti Vineyard, Edna Valley. Medium ruby color, featuring ripe black cherry, vanilla/oak, and a hint of mocha. Medium-bodied with a fairly lively mouthfeel but somewhat short finish. Clavo 2008 “Collusion,” Paso Robles. 45% Cabernet Sauvignon, 33% Malbec, 22% Petit Verdot. Medium-dark color, ripe wild berry and darker fruit along with dried herbs and sweet oak. Medium weight on the palate with moderate tannins. 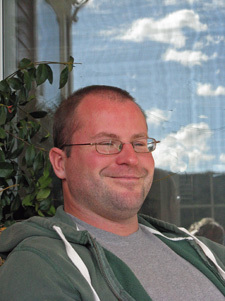 Clavo was founded in 2004 by Neil Roberts, who runs Roberts Vineyard Services. Neil has been a viticulturist for over 20 years. His family grew grapes and other crops in the Central Valley, and after graduating from California State University in Fresno, Neil went back to the farming business, where he worked as a viticulturist for Mondavi among others. He gained the nickname “Clavo” when he was younger and working in the vineyards – the Spanish word for “nail,” Clavo was a play on his name given him by the field workers. Clavo Cellars purchases all of their fruit from various Central Coast vineyards that Neil manages. Vineyard locations include both the Eastside and Westside of Paso Robles, Margarita Vineyard in the very southern part of the AVA, and Righetti Vineyard in Edna Valley. The wines are made at the Midnight Cellars facility. 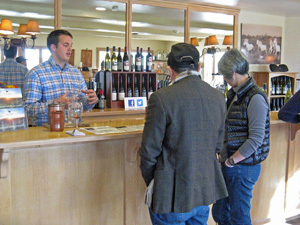 Courtney at the tasting room was busy pouring for a good-sized number of tasters on a late Friday afternoon. She told us that the tasting room has been open for about four years. In addition to the wines we tasted, Clavo also makes Viognier, Grenache Blanc, Grenache Rosé, Syrah, a Syrah / Cabernet / Petit Verdot blend, Petite Sirah, a value red blend, and a Zin dessert wine. Courtney mentioned that 2009 was the first year that they added Pinot Noir to their line-up. This was my first experience with Clavo wines, and I have to say that they didn’t really hit the mark for me. In general, they seemed to feature a combination of riper fruit and lower acidity that is not my preference, and the reds were fairly oaky. 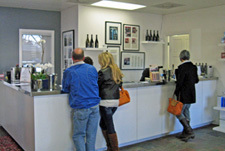 But judging from the obvious enthusiasm of most of the other people who were visiting the tasting room when my friends and I were there, the wines are popular. I can understand their appeal, and I won’t rule out another visit sometime in the future when I find myself on Main Street in Templeton. After our visit to Clavo, we all drove the few miles north into Paso Robles, where we checked into the Melody Ranch Motel, my usual place to stay in town. Frank, the owner, is always friendly and talkative, and he expressed disappointment that there will no longer be the annual Hospice du Rhône event in the spring. That’s not because he would be losing any business – the motel will undoubtedly be full then in any case – but because he wouldn’t be seeing so many of us who stayed there during the event year after year. Jane, Warren, and I were joined by Raquel Hug of Hug Cellars for dinner that evening at Villa Creek Restaurant – unfortunately Augie Hug was out of town on business. I had fennel-crusted salmon with sunchoke, lentils, beets, grapefruit, and frisée – it went perfectly with a bottle of Pinot Noir that I’d brought. My meals over the years at Villa Creek have always been enjoyable, and it was great to have Raquel’s company for dinner on this occasion. I was up bright and early on Saturday, since I had a slight detour to make before meeting again with Jane and Warren in Buellton in Santa Barbara County later in the morning. We were also set to meet friends Dorothy and Dana, who were driving from their home in Santa Barbara, and John Tomasso, who lives in Buellton. But first I needed to make a stop to pick up a few bottles from Giornata Wines, and since owners Brian and Stephy Terrizzi were out of town, they suggested that I pick them up at SLO Wine Studio on the south side of San Luis Obispo. I met Adrienne St. John there, and she showed me around the brand-new facility, just opened before crush in 2012, where Giornata and a number of other producers make wine. 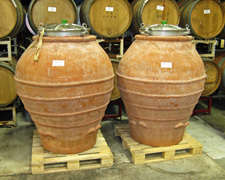 I spotted Giornata’s large oval wood cask made by Garbellotto in Italy – supposed to be the first such cask of this particular type in the country – and Adrienne also showed me their two new clay amphorae, which they are using for aging white wines. After my brief stop in San Luis Obispo, I continued south along Highway 101 to Buellton. Everyone was driving separately to our winery appointment in Buellton on Saturday morning, and it didn’t help matters that various computer and GPS directions pointed out the wrong location for the given address, directing several of us to the other side of a busy street. Fortunately for me, John Tomasso was walking from his nearby home to the winery and he spotted me driving slowly in my car, looking confused – as is often the case! He hopped in and in no time we were in the right spot, in front of Cold Heaven Cellars. Jane and Warren had already arrived, and they called Dorothy and Dana to make sure they knew the correct location. Before long everyone was there, and soon afterwards, Morgan Clendenen of Cold Heaven rolled up as well. She greeted us and welcomed us into the tasting room. 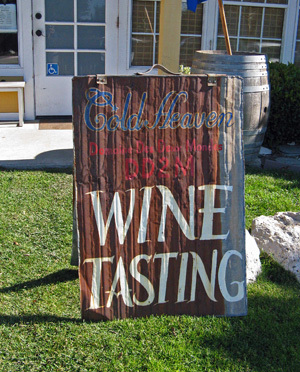 Cold Heaven 2010 Viognier, Le Bon Climat Vineyard, Santa Barbara County. Light yellow-straw color, bright lemon and stone fruit aromas with a minerally note and floral and spice undertones. Lively mouthfeel with a crisp finish. Cold Heaven 2010 Viognier, Sanford and Benedict Vineyard, Sta. Rita Hills. Light yellow color, more intense aromatics than the first wine, leaning more toward citrus with a touch of apricot, and with more distinct minerality and spice, and less of the floral component. More weight on the palate but with brisk acidity and a fresh, lingering finish, very nice. Domaine Des Deux Mondes 2009 Viognier, “Saints & Sinners,” Sanford and Benedict Vineyard, Santa Barbara County. Medium-light color, the oak component was noticeable along with pear, stone fruit, and spice. Richer mouthfeel but retaining good acidity on the finish. This is a Viognier to cellar for a few years. Cold Heaven 2010 Pinot Noir, “Makepeace,” Santa Barbara County. Medium ruby color, this featured earthy black cherry and plum fruit, dried herbs and a touch of spice. Medium-bodied and lively, this finished with mild tannins. Cold Heaven 2010 Pinot Noir, “Nevertell,” Sta. Rita Hills. Dark color, this was more fruit-forward, displaying aromatic and ripe darker berry fruit, spice, and vanilla/oak. Bigger mouthfeel with a lush texture but still good acidity, this had a more tannic finish. Cold Heaven 2010 Pinot Noir, “Queenscup,” Santa Barbara County. Medium-dark color, with floral aromas plus dark fruit, herbs, and spicy oak on the nose. Medium-bodied with good structure for aging and a moderately grippy finish. This should develop nicely in the bottle. Cold Heaven 2010 Syrah, “Second Sin,” Sawyer-Lindquist Vineyard, Edna Valley. Dark color, pretty floral notes along with blackberry, pepper, along with savory and minerally components. Medium-full bodied with a lively mouthfeel and fairly big tannic finish, a terrific young cooler-climate Syrah. Domaine Des Deux Mondes 2008 Syrah, Santa Barbara County. Dark color, with herbal, spicy dark fruit, vanilla/oak, and floral undertones. Rich and structured, finishing with big, chalky tannins. This needs time but could evolve well in the cellar. I’ve been familiar with the Cold Heaven wines for many years, first tasting them at annual visits to the Au Bon Climat / Qupé springtime open house events at the winery back in the 1990s – I may well have tried the first Cold Heaven releases back then. 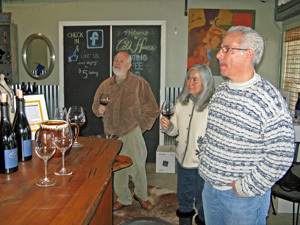 But it had been seven or eight years since I’d been to the Cold Heaven tasting room, when it was located in Los Alamos. The current tasting room is in a small room that’s only partially separated from the winery space behind it, so it was really chilly in there – “Cold” Heaven indeed! For those who don’t know, Morgan is the acknowledged “Queen of Viognier” – certainly among the best and most consistent producers of cool-climate Viognier in California. She’s originally from North Carolina, and in fact had just gotten back from a trip there shortly before our visit. Morgan told us that she’s thinking of planting trees that will produce black truffles in the Black Mountain area there. She started out in the wine business in North Carolina working for a small wine distributor, where she was able to taste many good wines and develop her palate on the job. Before long, she was hired for a sales position at Robert Sinskey Vineyards in Napa and she moved to California. It was while she was there that she met Au Bon Climat’s Jim Clendenen – the two eventually married and she moved to Santa Barbara County. Though no longer married, Morgan and Jim remain on good terms, and she told us that she values his opinions on her wines. She found that being more closely involved with a winery, she increasingly wanted to make her own wine, though she’d had limited experience in the cellar at that point. Like a number of others in the wine business, she learned winemaking through hands-on experience, and having Jim and Qupé’s Bob Lindquist right there gave her a couple of great teachers to start off with. Morgan said that she also credits then-Sanford winemaker Bruno D’Alfonso and Kris Curran a great deal with helping her learn the winemaker’s art. But in addition to these teachers to guide her, Morgan always had her own ideas of what she wanted to do. Morgan realized that it didn’t make sense for her to focus on Pinot Noir, since that was already Au Bon Climat’s specialty. Her break came when the winery was offered some Viognier fruit from Sanford & Benedict Vineyard, and she saw that as an opportunity to do something different. In the mid-1990s few producers in California were making Viognier, and Morgan could see that most of what was being made at that time was not very good. She found many of the wines to be overly ripe and lacking in acidity, something that was not the case with the great Viogniers of Condrieu in the northern Rhône. The Cold Heaven label was launched in 1996, the name coming from a Yeats poem called “The Cold Heaven” – the name appealed to Morgan as some people had told her that Viognier would never ripen in the cool climate of Sanford & Benedict Vineyard. 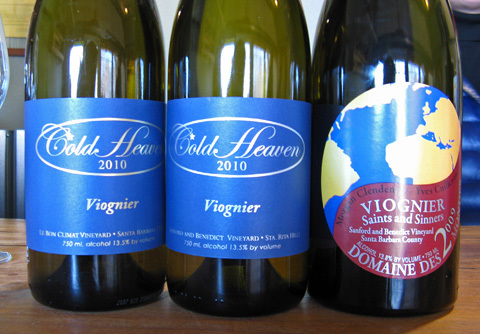 Early Cold Heaven releases did include some Pinot Noir – from Bien Nacido and Le Bon Climat vineyards – as well as the Sanford & Benedict Viognier. In subsequent years, other Viognier bottlings were added, including ones from Le Bon Climat, from warmer Vogelzang Vineyard in eastern Santa Ynez Valley, and from Alban Vineyard in Edna Valley. I remember how different the Cold Heaven Viogniers were from other California versions when I first tasted them. Besides picking the fruit earlier to preserve the acidity, another thing that Morgan did that set her Viogniers apart was to use only neutral oak for aging the wine. Cold Heaven stopped making Pinot Noir for a time during the 2000s, but it has been back since the 2008 vintage. In 2003, Morgan added Syrah to the Cold Heaven line-up and it has continued ever since. While Morgan had some winemaking assistance in her earlier vintages – and she acknowledged more than once how much Bruno and Kris’ advice helped – she’s been making the wines entirely on her own in recent years. Current overall annual production is around 1,200 cases, though Morgan told us that she would like to increase it a bit. Morgan has another label too, Domaine des Deux Mondes (DD2M). This is a partnership with Yves Cuilleron, a star vintner of the northern Rhône who is particularly known for his Condrieu bottlings. The project started in the 2002 vintage with a Viognier that was blended from 50% Santa Barbara wine and 50% Condrieu. Called “Deux C,” this was a unique blend, and similar wines have only been produced a couple of times since that initial bottling. That first effort led to Morgan taking Santa Barbara fruit and making Viognier in Yves’ style beginning in 2004 – unlike her Cold Heaven wines, the DD2M Viognier uses somewhat riper fruit and employs a fair amount of new French oak. In 2008 a DD2M Syrah was introduced as well. As we started out tasting some of Morgan’s wines, we talked with her about the vineyards she buys fruit from. She mentioned that she likes the romantic notion of being a vintner walking through the rows of vines, but she doesn’t have any desire to farm a vineyard herself. The first wine we tried was the current 2010 Viognier from Le Bon Climat Vineyard, located at the intersection of Foxen Canyon Road and Palmer Road, just outside the small town of Sisquoc. Le Bon Climat is owned and was planted by the Clendenen family, and is on old riverbed soil. Morgan said that the Viognier fruit there is a “suitcase clone,” supposedly brought from Château Grillet in Condrieu to California by John Alban. Morgan started buying fruit from there in 1998, and the vineyard was already organically-farmed then, as it has been until recently. She told us that the vines had a serious mealybug problem that they were not able to resolve using organic methods – now that the mealybug issue has been dealt with, the vineyard will go back to organic farming but it will take 4-5 years before it can be re-certified. Morgan noted that in her experience, organically-grown fruit sometimes has more of what she called “product” on the berries (residue from various sprays) than minimalistically-farmed non-organic fruit. She said that the vines typically need to be sprayed more often with organic farming, as the effect of organic spray products does not last as long as most non-organic sprays. Morgan told us about the Viognier from Vogelzang Vineyard in the warmer Happy Canyon area – this has what she called the “R” clone planted. The “R” for is for Roussanne and also for Randall (Grahm), who was the initial source of what was believed to be Roussanne that was planted in a number of places in California in the 1990s but which turned out to be Viognier. Morgan noted that she believes this clone does best in warmer-climate vineyards. She continues to get Viognier from cooler-climate Sanford & Benedict Vineyard, which has Davis clone Viognier vines that are about 30 years old. Interestingly enough, Morgan told us that the Viognier she got from warmer-climate Curtis Vineyard came in after the cooler Sanford & Benedict and Le Bon Climat vineyards in 2010. She theorized that the vines at Curtis have adapted to the warmer area and did not react as much to a late-September heat spike that year as the vines in the other vineyards, where sugar levels climbed quickly (though Morgan noted that the acidity remained high). She mentioned that her cooler-climate and warmer-climate Viognier can often ripen a month apart, but with the heat spike in 2010, everything came in within the same week. And to make things crazier, her Pinot Noir came in at the same time too! The Cold Heaven Viogniers are all barrel-fermented and go through 100% malolactic fermentation to help tame their high acidity. Morgan has experimented with some Viognier made in stainless steel but she decided she prefers the way that barrel-fermentation rounds out the wines. As noted above, she uses older barrels on the Cold Heaven Viogniers – the Le Bon Climat wine is aged in barrel for about 10 months and the Sanford & Benedict for about 12, but this can vary. The final Viognier we tasted was from the Domaine Des Deux Mondes label, which Morgan described as being made in a “Montrachet” style with about 25% new oak, quite different from the Cold Heaven wines. She said that the oak does integrate with time, and the wine needs bottle age to show its best. Cold Heaven also produces a Santa Ynez appellation Viognier that we did not taste. This wine is from the warmer-climate sources from which Morgan gets Viognier, and she has noted that there still is not that much cool-climate Viognier planted in the south Central Coast. We moved on to the Cold Heaven Pinots. Morgan is tight-lipped when it comes to the vineyard sources of her Pinot Noir fruit. Though the wines may not have the same cachet without a famous vineyard name on them, from a small vintner’s standpoint, not revealing the fruit sources can be a good strategy for hanging on to them. That’s a particular issue with Pinot Noir, so highly sought-after from Santa Barbara County. We started with the 2010 “Makepeace” Pinot, which Morgan told us is 50% from a “well-known” Sta. Rita Hills vineyard and 50% from one in the Los Alamos area. The 2008 “Makepeace” was the first Cold Heaven Pinot Noir since 2002, made from fruit that Jim Clendenen gave Morgan from Le Bon Climat that year (thus the “Makepeace” name). The Pinots are aged for about 18 months in barrel. Morgan talked with us for awhile about Pinot Noir clones, and she said she’s still in the process of figuring out the best combinations of clones and vineyards for her Pinots. She mentioned that she used a lot of 2A clone in 2009 and didn’t care for the results – she didn’t think it was very “Pinot-like.” She told us that to help her determine what clones she wanted, she tasted clonal selections from some of the vineyards she was interested in, from about eight producers, and now feels she can identify Pinot clones very readily. Among the ones she particularly likes are 114, 115, 828, and Pommard. The second of the Pinots we tasted was the “Nevertell” – of course this refers to the vineyard sources, in this case entirely from the Sta. Rita Hills AVA. Morgan again mentioned the 2010 heat spike during harvest season. She told us that she was not able to get all of her fruit picked when she’d wanted it, resulting in some that was riper than she would have preferred. The 2010 “Nevertell” was indeed riper than the other two Cold Heaven Pinots from that vintage, but Morgan said that her tasting room customers often love it. She noted the dilemma of making wine the way she wants to, yet trying to give the consumer what they expect – since they may now come to think of the “Nevertell” as a riper-style wine than what Morgan would prefer to make. The final Pinot was the “Queenscup” – signifying that this is the top of the line, what Morgan would put in her own cup. It’s entirely 115 clone, sourced from three vineyards in the Sta. Rita Hills and Los Alamos areas. We finished up with Syrah, and Morgan mentioned that she feels it is easier to make restrained Syrah than restrained Pinot from the south Central Coast. The 2010 “Second Sin” Syrah fruit came from biodynamically-farmed Sawyer-Lindquist Vineyard, located directly across the road from Alban Vineyard near the southern end of cool Edna Valley. The fruit was picked at 21 brix and soaked up to 22, and even at those numbers it tasted perfectly ripe. I think this is quickly becoming one of the finest Syrah vineyards in the south Central Coast area. Morgan told us that she likes to use Ermitage barrels with her Rhône wines but not with her Pinots. We finished up with the 2008 Domaine Des Deux Mondes Syrah, from a Los Alamos-area hillside vineyard. Like the DD2M Viognier, this wine is made in the Yves Cuilleron style, using 100% whole-clusters and native yeast fermentation (the Cold Heaven fermentations are typically inoculated with selected yeast strains), and aged in about 30% new oak. The DD2M Syrah spends about two years in barrel and another two in bottle before release. The Cold Heaven Viogniers continue to be among the standard-setters for cool-climate Viognier in California. Both the Le Bon Climat and the Sanford & Benedict bottlings were very good, with the latter one being my favorite of the two. The vineyard distinctions really shine through on these two wines. I got the sense that Morgan is still experimenting a bit on where she will ultimately take her Pinots in the years to come, though the three 2010 releases were all good and quite different from one another, and I thought the “Queen’s Cup” was the standout among them. The Cold Heaven Syrahs have never gotten the same attention as the Viogniers, but if the 2010 “Second Sin” is any indication of what’s to come, that could change in a hurry – it’s an outstanding cool-climate Syrah and very characteristic of Syrahs I’ve tasted from Sawyer-Lindquist Vineyard. Of course the two Domaine Des Deux Mondes wines we tasted were quite different from the Cold Heaven ones, and though I preferred the style of the Cold Heaven wines, the DD2M bottlings certainly have their appeal too. Morgan is producing some excellent wines that do a fine job of showcasing the terroir of their vineyard sources. John needed to take off after we left Cold Heaven, but we asked him for a lunch recommendation – he’s in the restaurant supply business and knows the dining scene in Santa Ynez Valley better than anyone I know. He instantly suggested Succulent Café in nearby Solvang. A fairly new establishment right along the main drive in town, it features local and seasonal foods. We all enjoyed salads and sandwiches – I had the grilled “PBT” sandwich (house-cured pancetta, basil, and tomato, plus gouda and cheddar), which was outstanding. Another great dining recommendation from John! Our plans for the afternoon were simple – drive a few miles north to the town of Los Olivos and spend the rest of the day visiting tasting rooms there. 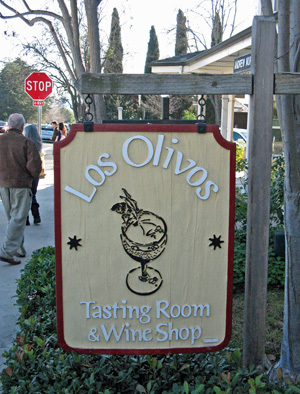 When I first visited Los Olivos over 20 years ago, it was a sleepy little town with a few galleries and shops, a couple of fairly basic cafés, and two or three low-key wine tasting rooms. But its location at the center of the Santa Ynez Valley wine region made it a natural spot for local wineries to open tasting rooms, and there are now no fewer than 25 of them clustered within a few blocks of one another in the center of town, along with more upscale dining, shopping, and accommodations. We’d gotten a recommendation from Morgan Clendenen to visit Saarloos & Sons to see whether Macy was working there that day – she also works part-time at the Cold Heaven tasting room – so we made that our first stop. I’d first run across Saarloos & Sons after spotting one of their estate vineyards some years ago, a spectacular terraced site near the northern end of Ballard Canyon, just west of Los Olivos. And I had tried a few of their wines at the 2011 Rhone Rangers tasting in San Francisco, where I thought their 2009 Grenache Blanc showed quite well. But I was not prepared for the crush of people inside their tasting room, housed in a nicely-restored 1886 house at the north end of “tasting room row” in town. It was a bit more of a party atmosphere than I’d expected – and not something I look for in a tasting room – but we made our way through the crowd to the quieter back tasting counter, where we found Macy. Besides the regular tasting, Saarloos & Sons offers a flight of mini-cupcakes, made locally by Enjoy Cupcakes, to go with their wines. While the cupcakes did look tempting, I thought it best to do my tasting without them. Saarloos & Sons 2011 Sauvignon Blanc, “Hunter,” Estate ECR Vineyard, Santa Ynez Valley. Light color, this had fairly shy citrus aromas along with herbal undertones. Lighter-bodied with good acidity and a fairly crisp finish. Saarloos & Sons 2010 Grenache Blanc, “Hers,” Estate ECR Vineyard, Santa Ynez Valley. Light color, with apple and pear fruit, a touch of lees, and a slight petrol note. Medium-light weight, with a round mouthfeel and smooth finish. Saarloos & Sons 2009 Cabernet Sauvignon, “His,” Estate ECR Vineyard, Santa Ynez Valley. Medium-dark color, with currant and blueberry fruit, lots of spice, herbs, and a touch of oak. Medium-bodied and lively with milder tannins. Saarloos & Sons 2010 “1949,” Estate ECR/Windmill Vineyards, Santa Ynez Valley. 71% Cabernet Sauvignon, 29% Syrah. Medium-dark color, his featured plummy fruit, pepper, some green olive, and spice on the nose. More structured in the mouth, finishing with moderately grippy tannins, very young but showing promise. Saarloos & Sons 2009 “Father & Sons,” Estate ECR/Windmill Vineyards, Santa Ynez Valley. 53% Grenache, 27% Syrah, 20% Mourvèdre. Medium-dark color, displaying ripe black cherry and plum, earth, and a minerally note. Big and quite tannic, needing more time in the bottle. 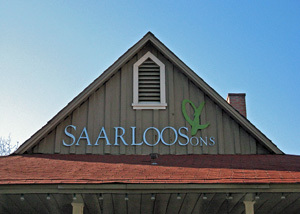 We learned from Macy that all of the fruit for the Saarloos & Sons wines is estate-grown and family-farmed. They started with the terraced 14-acre Windmill Ranch vineyard planted around 2000 in Ballard Canyon – this is planted to Syrah, which they have sold for years to a number of other vintners. The first small release of their own wine was in 2003, and they’ve been growing steadily since then. They also planted another site – ECR Vineyard – near the junction of highways 101 and 154 to the north of Windmill Ranch in a warmer location. Grenache Blanc, Sauvignon Blanc, Grenache, Mourvèdre, Cabernet Sauvignon, and Petite Sirah are among the varieties grown at ECR Vineyard, which Macy told us can get both 10 degrees hotter during the day and 10 degrees colder at night than Windmill Ranch. Winemaker Keith Saarloos came by the tasting counter to say hello. It was evident that he was greatly enjoying the proceedings at the busy tasting room – he was constantly in motion, talking with everyone, and always with a very genuine smile on his face. From our experience at the tasting room and from the winery website, it’s clear that the Saarloos & Sons is very family-oriented, with wine names like “His,” Hers,” and “Father & Sons,” and old photos of family members adorning most of the labels. Every vintage produces a different set of wine names and label photos. It’s also clear that Saarloos & Sons take their roles as family farmers seriously, though they do know how to have fun at that tasting room! Besides the wines we tasted during our visit, Saarloos & Sons has also made Chardonnay, Pinot Noir, Grenache, Syrah, Petite Sirah, a Bordeaux-style blend, and a Syrah-based Port-style wine. Annual production is in the range of around 3,000 cases, much of which they sell directly through their tasting room and wine club. Despite my initial misgivings when we walked into the tasting room, I enjoyed my visit to Saarloos & Sons. Macy did a great job of alternating between the more “serious” tasters and those who were mainly out just for a fun afternoon (not to imply that there’s anything wrong with doing that! 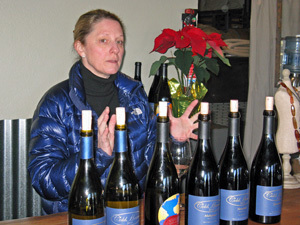 ), and she was informative about the winery and the wines. My favorites of the wines we tried were a couple of their newest releases – the “Hunter” Sauvignon Blanc and “1949” Cabernet / Syrah blend. If you’re looking for a little more fun in a tasting room environment in Los Olivos, Saarloos & Sons is the place to go. We walked down the street toward the flagpole – a large flagpole stands at the central intersection of town and provides a handy reference point. Jane wanted to stop at the Los Olivos Tasting Room – I think this is the only tasting room still remaining in town that was around when I first visited in 1992. I’d had iffy experiences there in the past and probably hadn’t stopped in for at least ten years, but figured it was worth another shot. Most of the wines that the tasting room carries are from smaller labels that don’t have their own tasting rooms, and they pour about ten wines to taste from a line-up that changes from time to time. Many of the wines available for purchase there are hard to find – including bottlings from Alban, Saxum, and Sea Smoke – though the prices for those are not cheap. Au Bon Climat 2010 Chardonnay, Santa Barbara County. Light color, with earthy pear and apple aromas. Medium-bodied with a fairly round texture and finish. Rendarrio 2011 Chardonnay, “Baja-Ha,” Santa Lucia Highlands. Light color, showing rather shy pineapple and other tropical fruit on the nose. Richer mouthfeel and smooth finish. Wrath 2010 Pinot Noir, “115/667,” Santa Lucia Highlands. Medium-light color, this displayed bright cherry and spice with a touch of vanilla/oak. Medium-bodied and lively on the palate and finish. Luli 2011 Pinot Noir, Santa Lucia Highlands. Medium color, featuring floral aromas along with characteristic SLH spice and black cherry, plus more a noticeable oak component than the previous wine. Medium weight with a richer texture in the mouth. Center of Effort 2010 Pinot Noir, Edna Valley. Medium-dark color, with intense, ripe black cherry and plum fruit, a touch of earth, and spicy oak. Rich, lush mouthfeel and a long finish. One Time Spaceman 2009 “Moon Duck,” Paso Robles. Grenache / Syrah / Mourvèdre blend. Dark color, with ripe dark fruit, an herbal note, and sweet oak. Medium-bodied and fairly round in the mouth, with moderate tannins. Barrack 2007 “Brand,” Santa Ynez Valley. Merlot / Cabernet Sauvignon / Cabernet Franc blend, sourced from the Happy Canyon area. Dark color, currant, blueberry, and spice on the nose along with earth and dried herbs. Medium-full bodied, finishing with grippier tannins, a distinctive wine. Chris Benzinger, the owner, was behind the tasting bar when we walked in, and he actually recognized me from my visits there years ago. But as has been my experience in the past, he was rather gruff and seemed somewhat disinterested (OK, there was a football game on the television screen at the end of the room, but he’s always been like that). Pours were on the small side, and the wineglasses were the type of old-fashioned small, thick ones that you don’t see much anymore at tasting rooms. He gave only perfunctory information on the wines, and moved very quickly from one pour to the next. Fortunately, Chris did have an assistant at the moderately-crowded tasting bar, and she was friendlier and more informative about the wines. The wines we tasted were all from various parts of the Central Coast. Au Bon Climat needs no introduction, but the other labels are not as well-known. Rendarrio is the label of winemaker Ryan Render. Besides the Chardonnay we tasted, they make Rhône-style whites and reds. Wrath has been around for awhile – they were known as San Saba prior to 2007, and they produce Sauvignon Blanc, Chardonnay, Pinot Noir, and Syrah, all from the Santa Lucia Highlands and elsewhere in Monterey County. Luli is a partnership between sommelier Sara Floyd and the Pisoni family of Santa Lucia Highlands fame – the winery makes Chardonnay and Pinot Noir from that region. Center of Effort is another Chardonnay and Pinot specialist, with longtime Central Coast vintner Mike Sinor heading up the winemaking. Made by Saxum assistant winemaker Mark Adams, One Time Spaceman features red blends from Paso Robles, using Rhône varieties, Tempranillo, and Zinfandel. From Happy Canyon Vineyards, the Barrack “Brand” is made by noted winemaker / restaurateur Doug Margerum. The selection of wines we tasted was not bad, though l wish the tasting experience had allowed me to enjoy the wines more and to evaluate them better. One bottle that was poured – and which I didn’t include in my tasting notes – was clearly oxidized and probably had been open too long. I knew going in that I would have to deal with some attitude at the tasting room, but it was good to be introduced to some small producers with whom I was not familiar. The Center of Effort Pinot Noir and Barrack “Brand” Bordeaux-style blend were my favorites of the line-up, and I had not tried wines from either of these labels before. Still, unless the tasting room happens to be pouring a wine that you particularly want to try, this may not be one of the essential stops to make in Los Olivos. 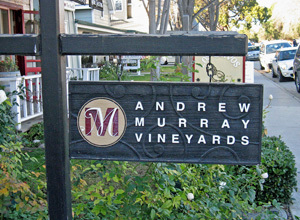 Our next stop was right next door, at the Andrew Murray tasting room. It had been awhile since I tasted there and I saw that the space had been remodeled since my last visit. I still remember tasting the very first Andrew Murray release, a 1994 Syrah from their old estate vineyard off of Foxen Canyon Road, and I was a fan of the wines in their early years. Friends and I would make regular visits to the springtime winery open house events, and the winery site surrounded by their hillside vineyards was stunningly beautiful. But I felt that the wines went through a down period in the later 1990s and early 2000s, and I was no longer an annual visitor though I would still stop in on occasion, even after the original estate property was sold and the winery moved to a more utilitarian space near Firestone Vineyards a couple of miles down the road. But I’ve had a couple of positive experiences with the Andrew Murray wines at large tasting events in the past few years, and I’ve been hearing good things about them recently too, so this seemed like a good time to get re-acquainted with the wines. Andrew Murray 2011 “RGB,” Camp 4 Vineyard, Santa Ynez Valley. 50/50 blend of Roussanne and Grenache Blanc. Light straw color, featuring pear and stone fruit with a touch of spice. Medium-bodied with a slight minerally note on the finish. Andrew Murray 2010 Central Coast. 60% Grenache, 25% Syrah, 15% Mourvèdre. Medium color, this had bright strawberry and raspberry aromas along with earth and spice. Lighter-bodied and lively on the palate with fairly mild tannins, nice. Andrew Murray 2010 Syrah, McGinley Vineyard, Santa Ynez Valley. Medium-dark color, with smoky bacon and plum and darker berry fruit on the nose, plus earth and a light touch of vanilla/oak. Moderately rich but well-structured, with medium tannins on the finish, nice. Andrew Murray 2010 Syrah, Great Oaks Vineyard, Santa Ynez Valley. Medium-dark color, this displayed more floral and pepper notes along with black fruits and more noticeable oak. A bit bigger on the palate but not heavy, and a grippier tannic finish. Andrew Murray 2010 Syrah, Terra Bella Vineyard, Paso Robles. Dark color, featuring ripe plum, spice, and a bigger vanilla component on the nose. Rich and mouthcoating, with chewy tannins, this was clearly a riper and somewhat jammy Paso-style Syrah compared with the others. Andrew Murray 2010 Grenache, Terra Bella Vineyard, Paso Robles. 97% Grenache, 3% Syrah. Medium purple color, showing earthy raspberry with touches of pepper and minerals. Medium-bodied with a lively texture and finish, nice. Andrew Murray 2010 Syrah, Thompson Vineyard, Santa Barbara County. Vibrant medium-dark purple color, this was less fruit-forward, with earth, black pepper, and herbs leading the way and darker berry fruit in the background. Big and structured on the palate, with a grippy tannic finish. Andrew Murray 2010 Syrah, Stolpman Vineyard, Santa Ynez Valley. Dark color, with more of a raspberry and red fruit profile, along with lots of spice and a touch of sweet oak. Rich mouthfeel and a big, tannic finish. Andrew Murray was studying paleontology at UC Berkeley when he discovered Rhône wines during a family trip to France, and he soon transferred to UC Davis to earn a degree in viticulture and enology. Andrew’s parents shared their son’s interest in wines of the Rhône Valley. In 1987 they sold their successful chain of southern California restaurants and purchased a 200-acre property in the hills above Foxen Canyon Road, soon planting 42 acres to various Rhône grape varieties with the assistance of Au Bon Climat’s Jim Clendenen among others. They also built a 5,000-square foot winery building atop one of the knolls on the site. In addition to his studies at Davis, Andrew learned hands-on winemaking during an extended internship spent with Australian vintner Roger Bowen in the Margaret River area. Andrew was just 22 years old during the winery’s first vintage in 1994 vintage. In 2006 the Murray family sold the property, which is now Demetria Estate, and since that time, Andrew has worked with a number of different vineyards to source his fruit. Tracy at tasting room guided us through a tasting of most of the winery’s current releases. We started with the “RGB” (for Roussanne Grenache Blanc) white blend, fermented in stainless steel and aged in neutral oak. I’ve felt that the Andrew Murray whites have always been solid, and it looks like this is still the case. Another strength of the winery over the years has been the “Espérance” Grenache-based blend, which we tasted next. Sourced from vineyards in both Paso Robles and Santa Ynez Valley, some whole-cluster fermentation was used in the 2010 vintage, and the wine was aged in about 20% new French oak. 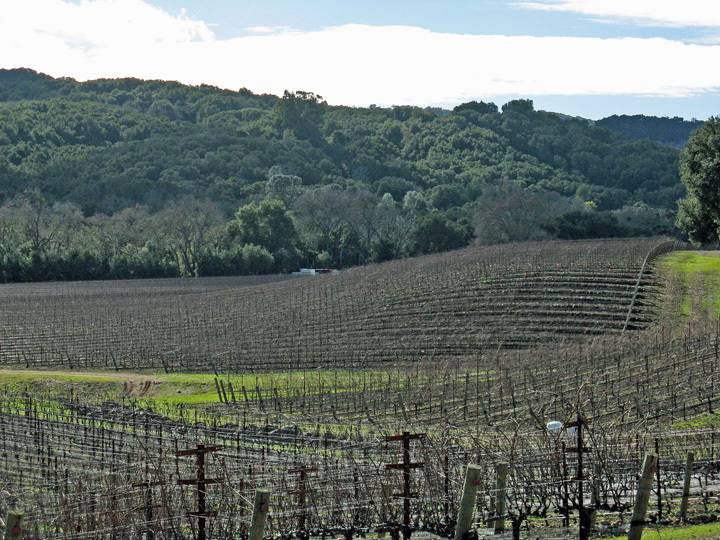 We continued with three single-vineyard Syrahs, from McGinley and Great Oaks – both in eastern Santa Ynez Valley – and Terra Bella, located near Tablas Creek on the Westside of Paso Robles. We finished our tasting with three reserve wines, a Terra Bella Grenache and Syrahs from highly-regarded Thompson and Stolpman vineyards. All of the wines are bottled under screwcap. It was starting to get later in the day, and there was one more stop I wanted to make before heading back to Solvang for dinner, so we got back in our cars and drove south from Los Olivos for a few miles to the tiny town of Ballard. 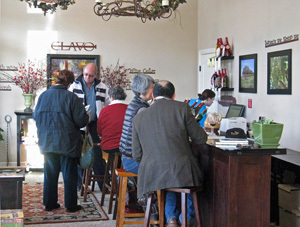 I try to make it a point to stop in at the Ballard Inn Tasting Room whenever I’m in the Santa Ynez Valley on a weekend. Located in a small bed-and-breakfast inn that also features an excellent restaurant, the tasting room is open only on weekend afternoons. I’ve known Barry Rossum, the tasting room manager, for many years. He knows his wine, and in fact he’s worked for well-known local wineries such as Arcadian and Tantara. Storm 2011 Sauvignon Blanc, Santa Ynez Valley. Very light straw color, featuring bright grapefruit and herb notes on the nose. Medium-light bodied with crisp acidity and a refreshing finish. Luminesce 2010 Pinot Noir, Laetitia Vineyard, Arroyo Grande Valley.Medium-light color, with red strawberry and red cherry, tea leaf, and a dash of black pepper. Medium weight on the palate with a lively finish and milder tannins. Kenneth-Crawford 2009 Grenache, Larner Vineyard, Santa Ynez Valley. Medium color, aromas of ripe red fruits, earth, a mineral note, and a good deal of vanilla/oak. Rich, mouth-coating texture with moderately grippy tannins. Luminesce 2009 Syrah, Thompson Vineyard, Santa Barbara County.Medium-dark color, this displayed pretty floral aromas along with dark fruits, black pepper, earth, and herbs. Big and structured, with chewy tannins. Showing potential for developing nicely with time in the cellar. Baehner Fournier 2009 “V3,” Estate, Santa Ynez Valley.84% Cabernet Sauvignon, 14% Merlot, 2% Petit Verdot. Dark color with intense currant and tobacco on the nose, along with touches of earth and sweet oak. Rich mouthfeel with big but refined tannins, nice. Barry always has an interesting group of wines to taste, usually available in one or two flights. These are usually wines from labels that are little-known outside Santa Barbara County, with a number of them being side projects from assistant winemakers for larger producers. The line-up changes periodically, and the wines are chosen to go with the food at the restaurant, just across the lobby from the tasting room. 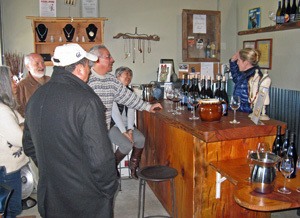 Barry welcomed our group to the tasting room and we settled in at the small wood bar set up along one side. Not everyone in the group tasted the same wines, but the ones I tasted featured a good deal of diversity in both grape varieties and styles. First up was a Sauvignon Blanc from Curtis assistant winemaker Ernst Storm. Ernst grew up in South Africa and worked for wineries there and in California’s Sierra Foothills before coming to Santa Barbara County. He also makes Pinot Noir and Syrah under the Storm label. The 2011 Sauvignon Blanc was sourced from four vineyards in Santa Ynez Valley, and was fermented mostly in stainless steel. The Luminesce wines come from former Tantara assistant winemaker Kevin Law. The Laetitia Vineyard Pinot Noir was sourced from both Martini and Pommard clones, while the Syrah came from prestigious Thompson Vineyard. The first Luminesce release was from the 2006 vintage – current releases include additional Pinot and Syrah bottlings, Semillon, Cabernet, and a Bordeaux-style red blend – expect to see additional varieties offered in the future too. In between the Luminesce Pinot and Syrah, I tasted a Kenneth-Crawford Grenache from Larner Vineyard in the Ballard Canyon area of Santa Ynez Valley. Barry told us that this may be one of the last releases from the label, as business partners Kenneth (Joey) Gummere and Mark Crawford Horvath have decided to go their separate ways. The winery was known for its Sta. Rita Hills Pinot and for Grenache and Syrah from Ballard Canyon. 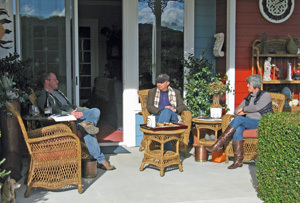 Baehner Fournier Vineyards is the project of husband-and-wife team of Dr. Robert Baehner and Vickie Fournier-Baehner. The fruit for their Bordeaux-variety reds comes from their five small estate vineyards in the warm eastern part of Santa Ynez Valley. In addition to the “V3” blend I tasted, they make a Merlot, Petit Verdot, and a 100% Cabernet Sauvignon called “Solus,” plus a Sauvignon Blanc sourced from Happy Canyon’s Vogelzang Vineyard. Nick de Luca, formerly of Dierberg and Star Lane (and with his own current Ground Effect label), took over as winemaker at Baehner Fournier not long ago. 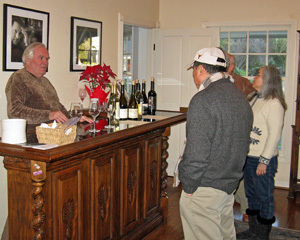 As usual, Barry presented an interesting selection of wines at the Ballard Inn Tasting Room. My favorites were the Storm Sauvignon Blanc and Baehner Fournier “V3” Bordeaux-style red blend, and the two Luminesce wines were nice as well. 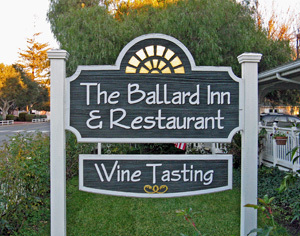 Unlike my experience at the Los Olivos Tasting Room, it was a pleasure to taste with Barry at the Ballard Inn. He’s friendly and informative, and spends the time to give each customer a personalized experience. And although I was somewhat familiar with the small producers whose wines I tasted this time, these were all new bottlings to me so it was good to see what directions these wineries are going in – and they all look promising to me. I enjoy my visit to the Ballard Inn Tasting Room every time I’m there, and I’ll continue to come back. 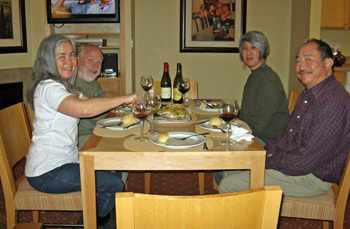 Jane, Warren, and I stayed at a timeshare facility in Solvang during our stay in Santa Barbara wine country – on several wine trips we've found that to be a nice alternative to a motel, allowing us the option of having relaxing dinners and breakfasts at our temporary home base. Dorothy and Dana were able to join us for dinner at the Solvang timeshare before they headed home to Santa Barbara, so after leaving the Ballard Inn, we stopped at a market on our way back and picked up some groceries. 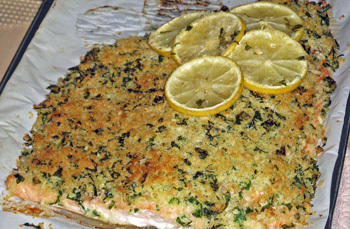 The meal turned out great, thanks mainly to Jane and Dorothy – the main dish was panko-crusted salmon, which went well with a 2002 Rochioli Pinot Noir. We were able to catch most of the 49ers-Packers playoff game on television, and Dorothy and Dana left after the game, taking plenty of leftovers with them.